I had never really imagined a Christmas cut-out cookie in chocolate until last year at this time, when Cindy gave me a little bag of them. Instead of saving the cookies and taking them home to share, I ate every last deep-dark one while we chatted over a cup of tea. They were almost as good as her poetry. 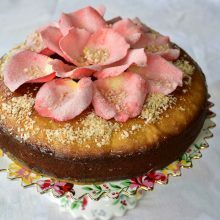 Recipe? I said. Yes! She said. Then a year later, when it came time for cut-out cookies again, my mailbox contained the recipe from Cindy. O joy. I made them immediately and loved the flavor, but the shape was an issue. I wanted them to hold their shape perfectly, with razor-sharp edges that would be reminiscent of my other go-to cut-out cookie recipe. One that tastes wonderful and still takes well to decorating with royal icing. Royal icing may not impart the same buttery flavor that my mom’s vanilla butter frosting for Christmas cookies does, but the perfect way royal icing coats a cookie and becomes a canvas for piping is, for me, irresistible. I first started going a little overboard with Christmas cookie decorating the year I was homebound from school with mono. I was 16 and spent about a month on the couch, in the midst of the gut rehab of our kitchen. I could not even look at food let alone eat it, so the non-functional kitchen didn’t bother me all that much. It was completed right around the time my mono-haze lifted, and my mom and I baked Christmas cut-out cookies to celebrate. I spent the better part of a day corralling tiny multi-colored sprinkles into lines that looked like lighted garland on the Christmas tree cookies. They were, I must say, gorgeous. You kind of hated to eat them (but you got over that). I wish I’d been taking food photos back then, for posterity. This year the nexus of all that is holiday nirvana in the kitchen came together for me with the marriage of the chocolate cut-out cookie and royal icing. I went on a search for a chocolate cookie that would impart dark chocolate flavor but still hold its shape, and I found it over at one of my favorite culinary blogs, Smitten Kitchen. Which in itself was serendipitous because just recently the author of that blog published her first book. And it landed on the New York Times bestseller list. That kind of success story makes me both crazy-frustrated (like Cindy Brady yelling out to all of the kids running ahead of her: “Hey! Wait for ME!”) and excited. Inspired. Encouraged to stay steady on my own book-writing path (more details to come). 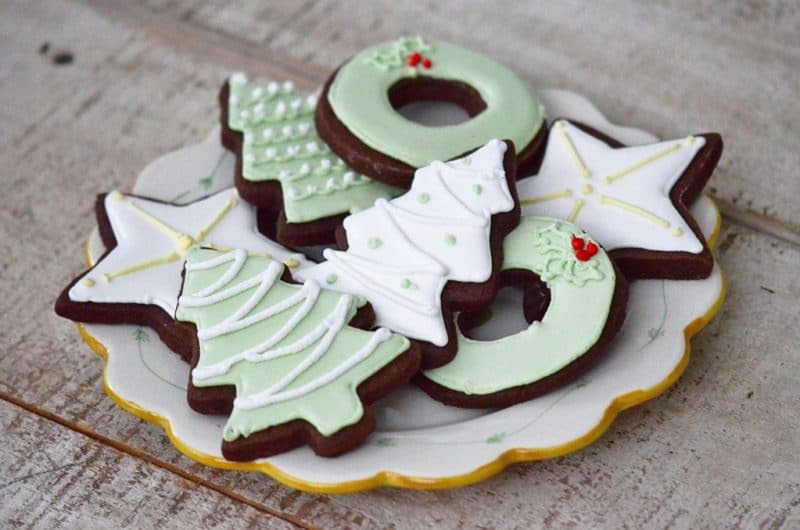 Whether you want to go all out and ice your cookies with a piping bag, or stick with a basic butter frosting or, even simpler, use some decorating sugar or powdered sugar or no icing at all (which is how Cindy presented hers), the chocolate cut-out is a revelation. They are unexpected. They are beautiful. And yet, unlike most things that breed great success, they don’t take all that much hard work and finesse to come out a winner. The key to cut-out cookies that hold their shape is a single mantra: chill, chill, chill the dough. Taking the extra 15-minute chill increments makes a difference. These cookies are based on a recipe from Smitten Kitchen, and despite the simple list of ingredients they impart deep chocolate flavor. I like Droste or Sharffenberger cocoa powder, but any will do. I roll my dough to ¼-inch thickness, but it can be rolled thinner, 1/8-inch. Makes about 40 3 ½ -inch cookies. Whisk dry flour, salt and baking powder in bowl and set aside. Mix butter, sugar, eggs, vanilla and cocoa in mixer, using the paddle attachment. 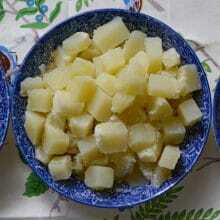 Gradually add flour mixture, and mix until smooth. Wrap in plastic and chill for at least one hour and up to two days. The longer the dough is chilled, the longer it needs to sit out before rolling (at least an hour if the dough has been chilled for a day or longer). Pre-heat the oven to 350 degrees. Line heavy baking sheets with parchment paper. Roll out cookie dough between two sheets of waxed paper. For chilled dough that is still somewhat hard, bang the rolling pin down on the dough to soften and begin to flatten it. Roll from the center out, holding the paper down with something heavy or grabbing the paper between you and the counter’s edge to hold it in place while you roll. 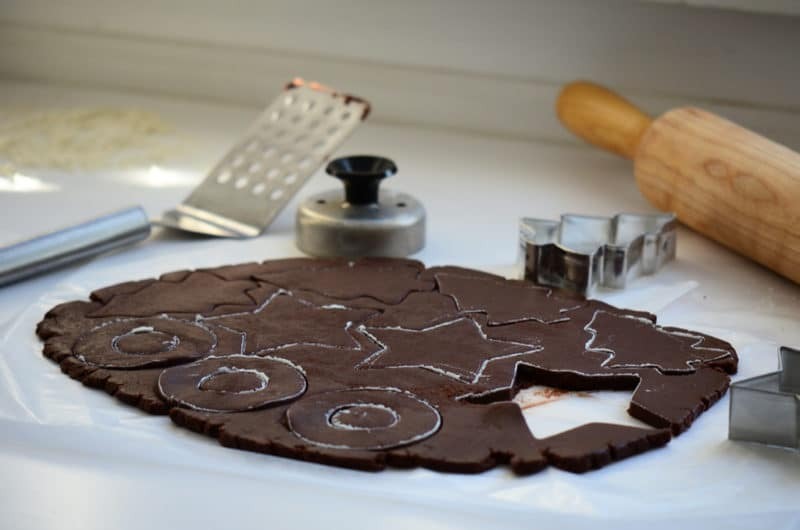 Dip the cutters in flour (or cocoa powder) before cutting, each time you cut shapes. Chill the rolled, cut dough (waxed paper and all) in the refrigerator for 15 minutes (on a sheet pan if needed for a flat surface in the fridge). Transfer the shapes to the sheets using a metal spatula. 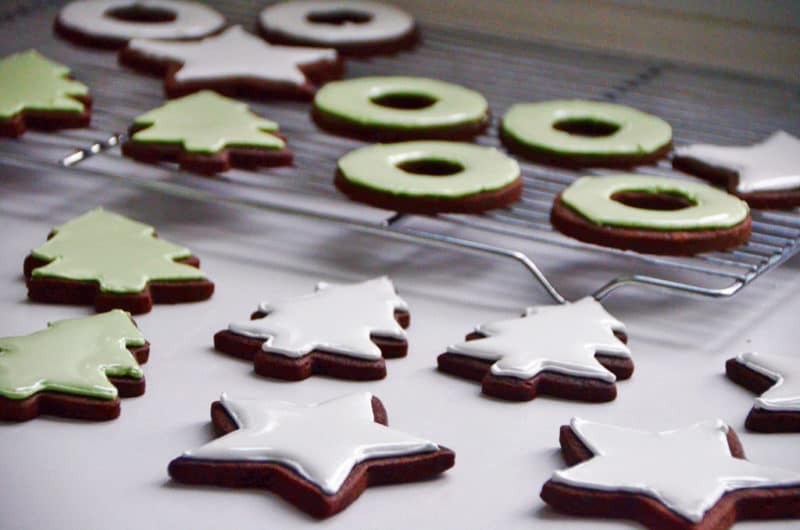 If using decorating sugar, gently press it into the cookies now, before baking. 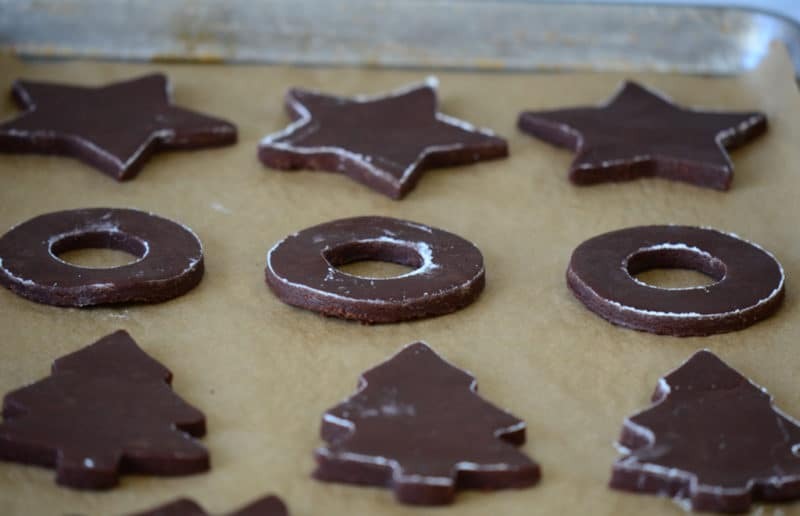 Bake for 8 to 11 minutes (the former for 1/8-inch thick cookies, the latter for 1/4-inch cookies) until the edges are firm and the centers are slightly soft and puffed. Gently press dough scraps together and wrap in plastic. Chill and repeat the process, using fresh waxed paper each time you roll out a new batch. Transfer baked cookies to a wire rack to cool. 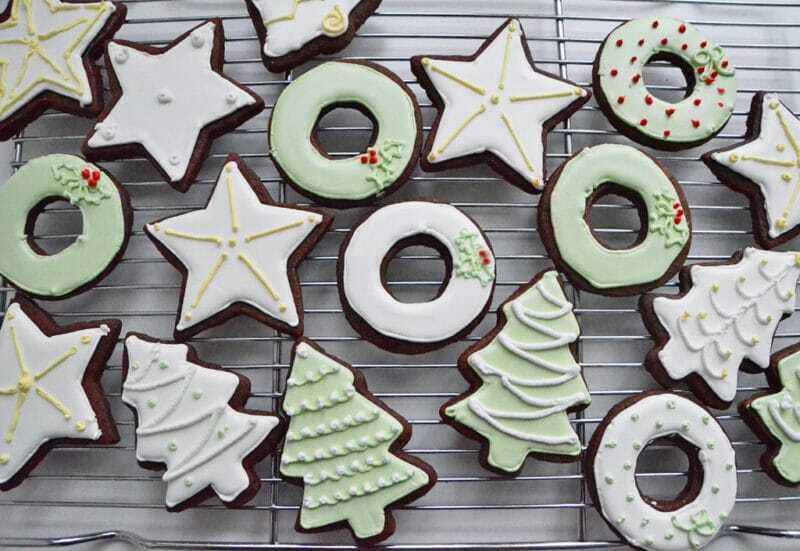 Decorate with royal icing or butter icing, or with powdered sugar. Not all meringue powder is created equal. 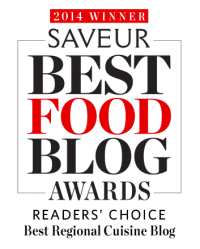 Williams-Sonoma, Ateco, and AmeriColor have better flavor than craft-store brands, but any will work. The thick royal icing keeps for a week in the refrigerator, covered with plastic wrap right up against the icing. The thinner “flood” icing should be used right away; let it sit, covered in the same way, for a few minutes before using to let the air bubbles surface. I use a #2 tip for outlining and a #1 tip for decorating. Find more great tips for decorating with royal icing here. Using a stand or hand-held mixer (paddle attachment), beat the meringue powder and water until incorporated and foamy. Add the powdered sugar and corn syrup, and beat on low speed speed until sugar is wet, then beat in medium high until stiff peaks form, about 5 minutes. 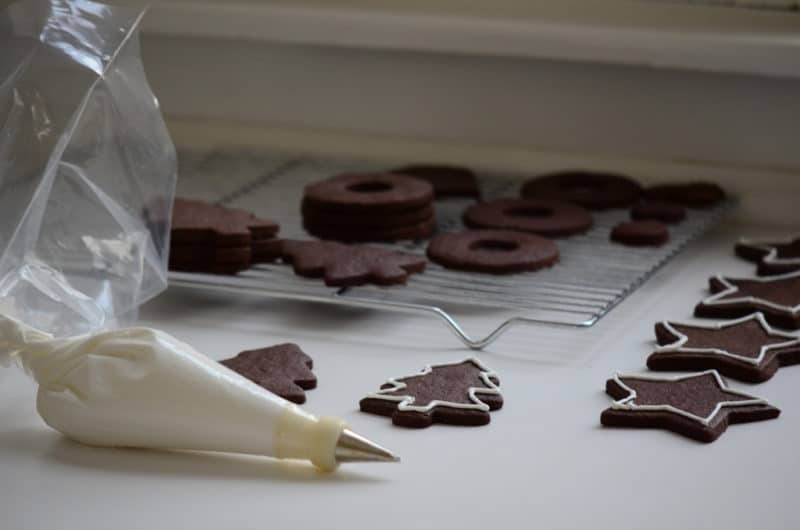 Different consistencies of icing are needed for various tasks: thicker icing is necessary to pipe the outer edges of the cookie (this holds the flooded icing in place) and to decorate the top, but not so thick that you can barely squeeze it out of the piping bag. 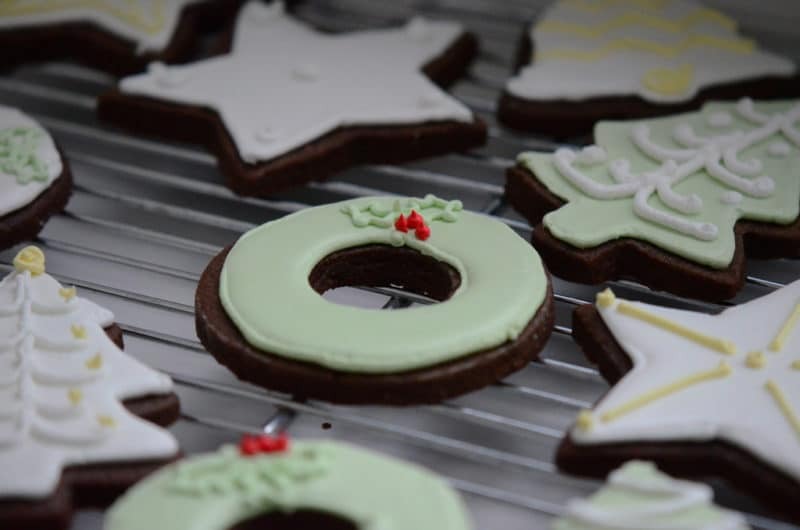 Thinner icing is necessary to flood the cookie with icing—the icing should run in a ribbon off of a spoon the bowl of icing, forming a line that stays on top of the icing briefly before sinking in. If you are coloring the icing, divide the icing into bowls at this stage and add very small amounts of coloring at a time (a little goes a long way). Adding a small amount of brown to any color can give it depth. Be sure to keep the icing covered directly on the surface with plastic wrap at all times, or a skin will form. 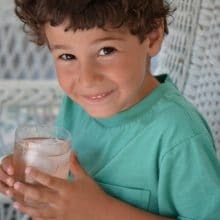 The icing will keep in the refrigerator for a day or so; reconstitute it by stirring it and adding a touch of warm water as needed. To spread or ‘flood’ the outlined cookie with icing, spoon it on and push it into the corners with the back of the spoon rather than piping it; this makes the flooding easier to control, I found. Let the flooded icing dry on the cookies for a couple of hours or overnight in a cool, dry place. Pipe your decoration on the cookies, first practicing your design on waxed paper. Let the piped design dry before handling the cookies. 8 Responses to "Chocolate Cut-Out Cookies with Royal Icing"
You seem to make things that make my mouth water. Beautiful job on the cookies,and i never meet a cookie i didn’t like, i want some of those. Janis & I will be making them next week when she comes “home for the holidays”. Thanks again, Maureen! Merry Christmas!! Those are the prettiest cookies I have ever seen. I would wallpaper a room with them. Shellac them and hang them all over my Christmas tree. The green and brown and white combination is beautiful! I’m sorry it took me a year to send the recipe. Simply gorgeous, Maureen, you rock!! Just printed out this recipe and am on my way into the kitchen now to make them! Hoping mine look half as good as yours!! I’ve never seen chocolate frosted cookies for Christmas. Love how the frosting colors stand out against the chocolate. I’ve made chocolate heart shaped cookies for Valentine’s Day and dipped half of each cookie with pink or white frosting. The chocolate cookie recipe I have calls for cayenne pepper.